3/22/2011Share this story on Facebook! 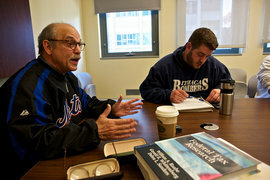 Professor Alan Cohen teaches an accounting class. Every tax season, Ithaca College accounting majors head downtown to Alternatives Federal Credit Union, grab a computer, and help low-income families get up to $6,000 in earned income tax credits. The numbers add up fast. In 2009, 19 accounting majors dedicated 504 hours to VITA, the Volunteer Income Tax Assistance program—the equivalent of 21 days of nonstop tax preparation. “Thanks to these students, together with another 64 community volunteers, some of whom are IC staff, the total tax refunds returned to Tompkins County residents through VITA was $3,469,000,” says Brian Zapf, the community tax program director at the bank. IC students, he says, were responsible for about $950,000. Of course, there were small problems along the way. Some students found the TaxWise software hard to use, and some tax preparations were difficult because of the sheer number of variables. But Waddell says there was always someone to help if they had questions.